New to Me Brand! Indigo Bananas! Oh my dearest readers. I cannot begin to express to you the amazingness that has happened over the weekend. Perhaps you are not aware of my penchant for flakie polishes and if not then allow me to enlighten you…I get faint at the thought of beautiful flakie polishes! They are by far and away one of my favorite things about nail polish and I like love just about everything about nail polish. So when I saw Indigo Banana’s Summer Rains collection, I knew that some of them at the very least would find their way into my collection. I told my family that when I put the first one on that it was like the heavens opened up and choirs of angels sang in exultation over the loveliness of the polish…too much? I think not! 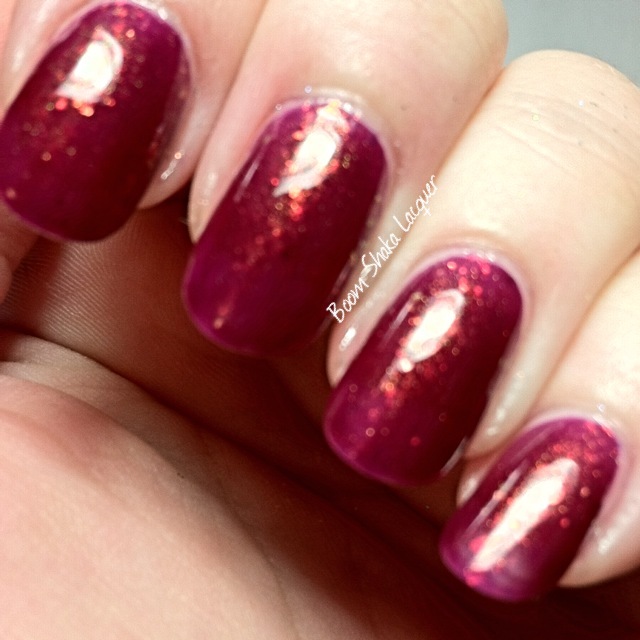 Reign is a stunning royal burgundy jelly polish with definite purple undertones to the rich deep red. 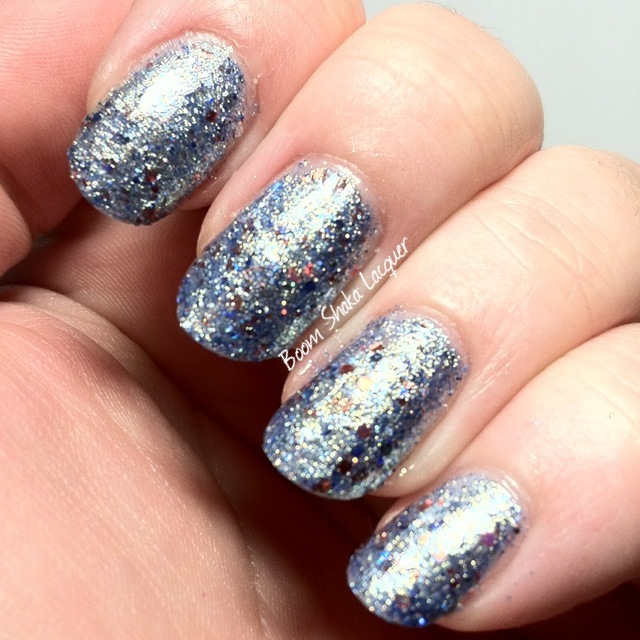 Packed into that jelly is a golden microshimmer and color-shifting flakies. It looks like buried flames within the depths of the squishy jelly polish! The formula on this was perfection. The jelly is sheer so it did take three thin coats to get this level of rich depth, but I don’t find that excessive and some people could definitely get away with 2 thin coats but the amount of free edge on my nails makes that difficult for jelly polishes particularly. 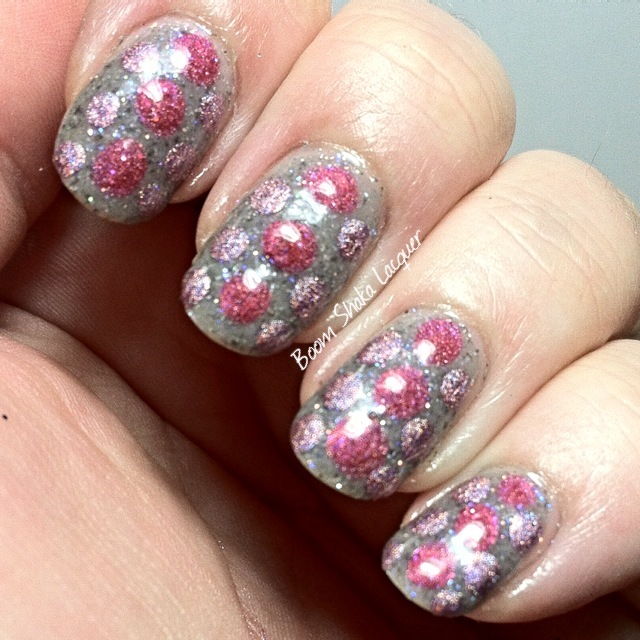 The flakies and shimmer are very evenly distributed throughout. Now I’m no huge fan of matted nail polish…but flakies NEED to be matted for you to get an idea of the true beauty that they possess! So I added a bonus matte shot for you all so that you can bask in the glorious flakiliciousness. Now do you see what I mean about the heavens opening up and choirs of angels singing? Yeah. This beauty is a deep blackened teal jelly base packed to the brim with a gold to bronze color shifting microshimmer and color shifting flakies! Seriously beautiful. Just look at that (excuse those little white dots, my matte topcoat is about to be replaced ASAP). I haven’t said it in awhile but this polish is AH-mazing! The formula is just like Reign – perfection. In fact I found both of these to be insanely easy to work with and very controllable. They also cleaned up nicely even though they are highly pigmented. Now I’m sure that you’re saying “self where can I get some of THAT polish? !” So here ya go! 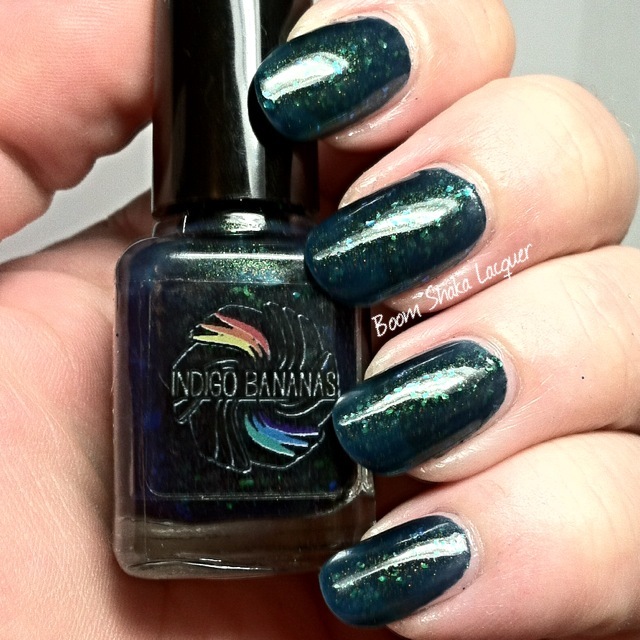 You can find Indigo Bananas nail polish on their site right here. If you want to keep up on all the news about Indigo Bananas you can find them on Facebook, Twitter, Instagram, and Pinterest. This entry was posted on June 30, 2014, in Indie Polish, Indigo Bananas. Darling readers! It’s really turning out to be Literary Lacquers week here at Boom Shaka Lacquer. There might be a reason for that…uhm because they are awesome! So today’s Pink Post is going to feature the raspberry pink twin sister to Pan Galactic Gargle Blaster; Raspberry Cordial! Raspberry Cordial is inspired by Anne of Green Gables when Anne (with an E if you please) and her friend Rachel Berry mistake some of Marilla’s homemade wine for Raspberry Cordial…hilarity and tragedy ensue from this debacle and there is no doubt that it’s one of the memorable scenes from the book! So I said it was the sister to PGGB. 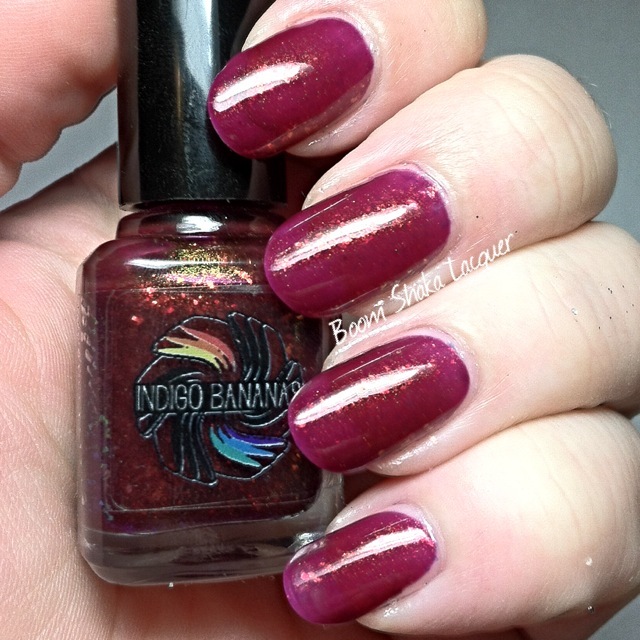 It is a dark raspberry pink linear jelly holographic polish filled with the same holographic sparks that PGGB has! These two are definitely related (Also how smart is Amy, both of them are named after DRINKS). The formula on this one is virtually the same as PGGB as well. Starts off sheer but builds nicely. The pictures show 2.5 coats plus topcoat! I threw in a flash photo to show off the linear holographic feature since the sunlight wasn’t cooperating. So I couldn’t bear not to do a little nail art…so here we go! So for this nail art look (which I’m still wearing!) I started with a base of Literary Lacquers – Annabelle Lee. Using my largest dotting tool I made large dots down the middle of my nails with Literary Lacquers – Raspberry Cordial. Then I went in with a smaller dotting tools and added six more dots using Color Club – Halo-graphic. I am totally digging on this mani…even my aunt said it was one of her favorites! This is also very easy so even beginners can do these kinds of nail art looks! 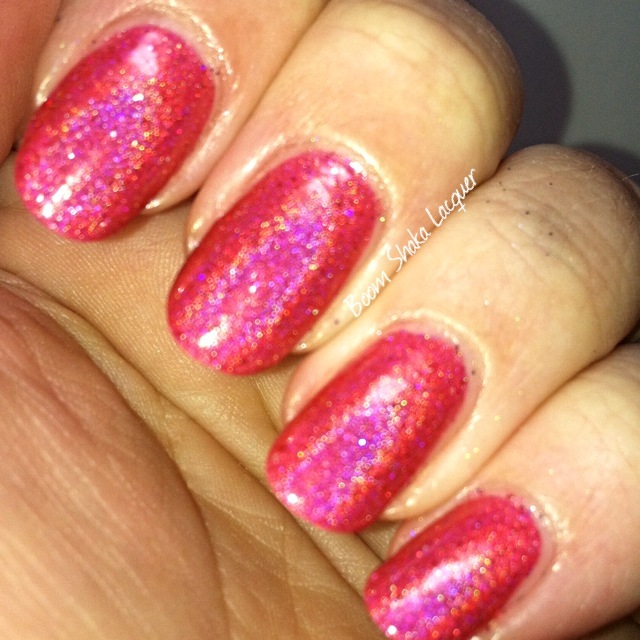 This entry was posted on June 25, 2014, in Indie Polish, Literary Lacquers, Wednesdays We Wear Pink. My Two Great Passions – Featuring Literary Lacquers! Readers, I cannot even begin to tell you how excited I am. Literary Lacquers combines two things that I am passionate about, reading and nail polish! I was unsuspectingly hanging out on Facebook one day with the Amazing Amy (this is what I call her in my head) from Literary Lacquers said she’d like to send some polishes for me to review. It was ALL I could do to contain myself let me tell you. I don’t have to contain myself any longer! So Amazing Amy sent me four beautiful polishes to review but ONE of them I’m saving for another post but I had a Literary Lacquer that I somehow had never put on the blog before (I really thought I had! The shame and embarrassment is real folks because I have used and loved this polish several times), so I’m going to review it here too! “We’ll dive right in with the bard himself,” as David Tennant’s character said in the Catherine Tate Red Nose Day skit! Up next we have Midsummer Night’s Dream! Now of course this is based on the wonderful play by William Shakespeare. 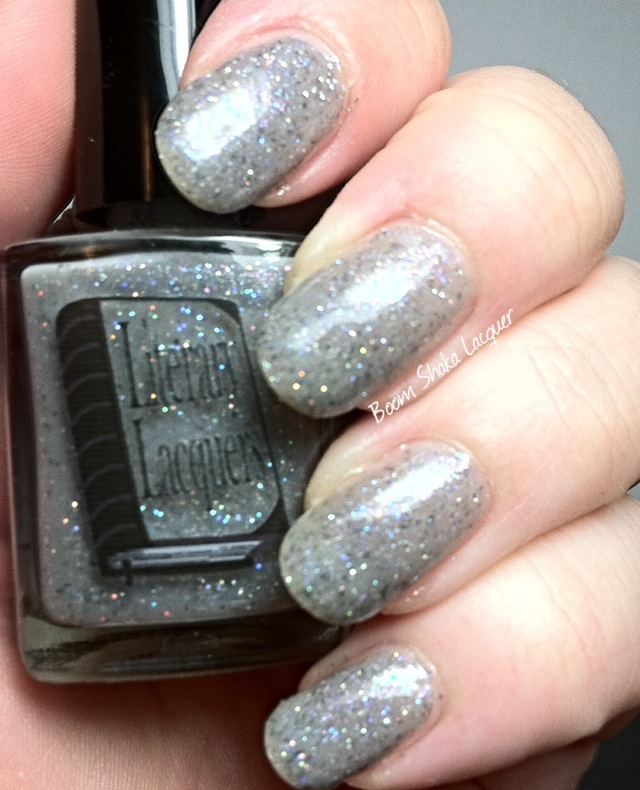 It’s definitely one of my favorites and I think that this polish does a good job of evoking the feeling of the play! 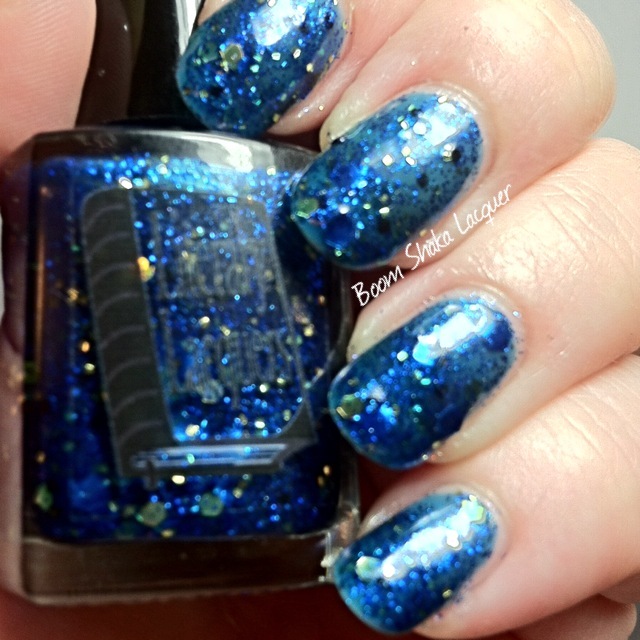 Midsummer Night’s Dream is a beautiful royal blue (dare I say it? TARDIS blue!) metallic? jelly polish. So I put the question mark because this jelly is unique it definitely has a foil or metallic quality but it is DEFINITELY also a jelly polish. The effect is really nifty and I really enjoyed that, I got the foily (not a word but I’m going with it!) 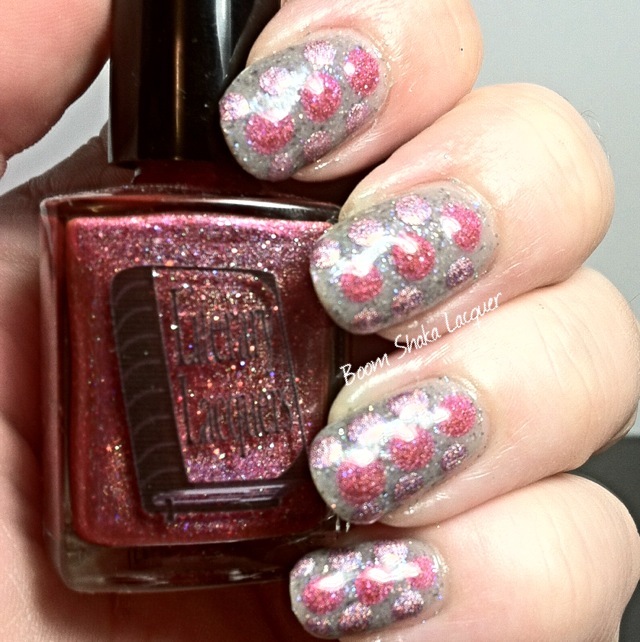 metallic payoff with all the squishiness that I love about jelly polishes! It’s filled with blue metallic and gold metallic and holographic glitters. Some of gold glitters have a reflective curl, but, they laid flat on the nail so it was definitely just appearance and not actual physical curling. I actually feel like it gave it a little depth and character that added to the unique qualities of the polish. Polishes Used: Glisten & Glow – Stuck on Blu; Literary Lacquers – Midsummer Night’s Dream; Digital Nails – Ain’t Nobody Got Time for That Topcoat. Next up in my line up of awesome Literary Lacquer polishes is Woman of Pleasure and it’s the only book (or poem…HINT) that I haven’t read before although from what Amazing Amy tells us it might be interesting to go and find it and read it even though it’s not in my wheelhouse as far as literature goes! 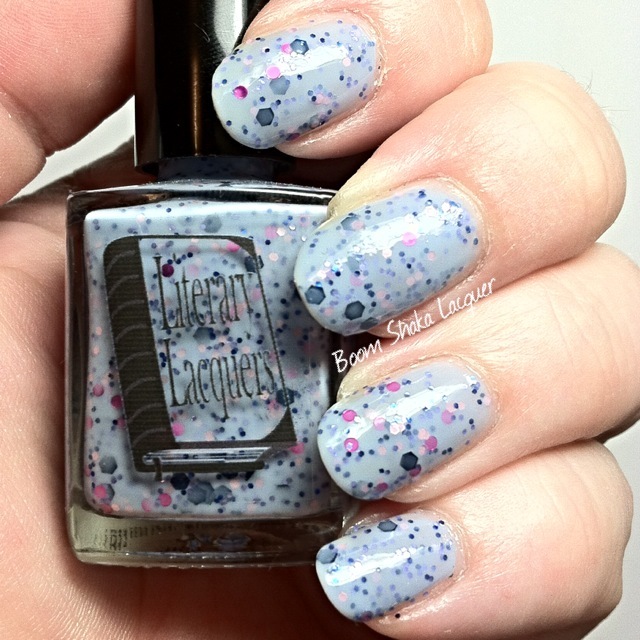 Now Literary Lacquers is well known for their awesome holos but let me tell you this crelly based glitter is SO awesome. It’s gorgeous and I just know that I will wear it again and again. It has a periwinkle base and it’s chock full of tiny navy blue metallic micro glitter, baby pink satin glitter, magenta metallic dots, and navy blue metallic hexes. Definitely a pleasing combination! Just look at that! I love crelly glitter polishes so much, they are definitely my favorite. This one had a perfect formula definitely one of the best I’ve used. This is two coats and I didn’t have to fish or manipulate the glitter on the nail. I also had a really good glitter spread without any hassle at all! In addition the crelly base is thick enough that it doesn’t really have any of the bumpy glitter issues some polishes have and it only needed a nice coat of topcoat to smooth it up and make it super shiny! Polishes Used: Glisten & Glow – Stuck on Blu; Literary Lacquers – Woman of Pleasure; Digital Nails – Ain’t Nobody Got Time for That Topcoat. 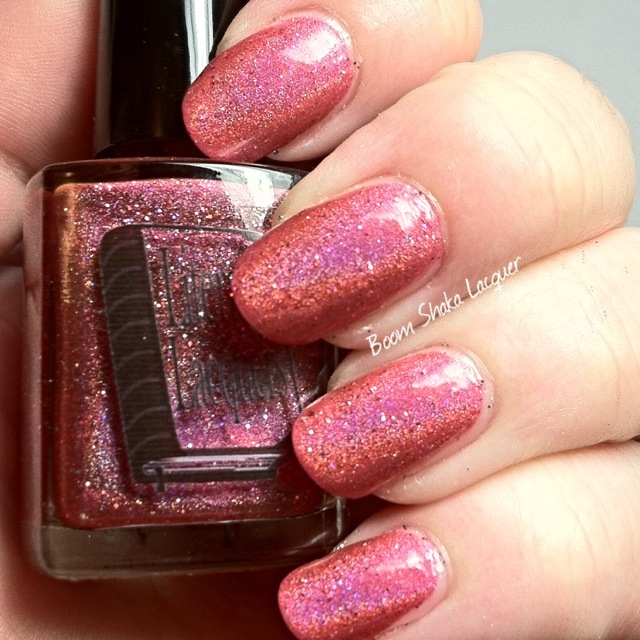 This was my first Literary Lacquer that I mentioned that I thought I had reviewed. I’ve used it several times in different manis and have really enjoyed it and now it’s time for you to get a look at Pan Galactic Gargle Blaster! PGGB (as we in the polish community like to call it because the internet is famous for abbreviating things) is part of the Literary Liquors Collection and is based on the drink made famous in The Hitchhiker’s Guide to the Galaxy! Of course you know reader by now that this color is definitely one that I am immediately drawn to and it’s NO SURPRISE that it’s the one I bought first so many months ago. Top that off with the geeky reference to The Hitchhiker’s Guide to the Galaxy and well I’m in nail polish heaven! 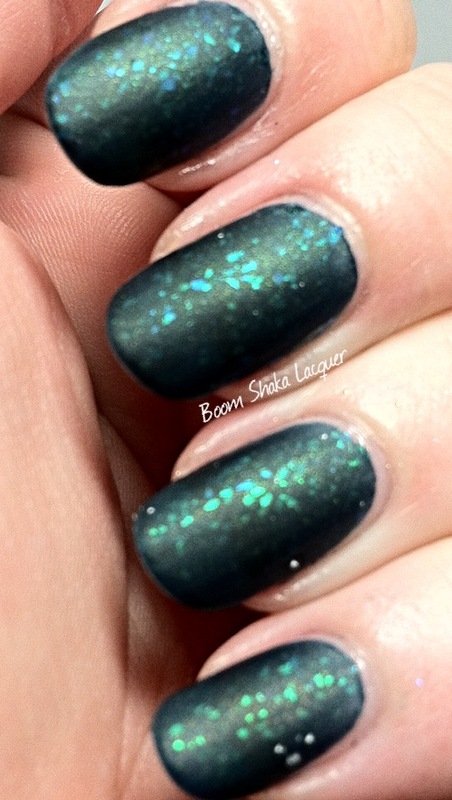 PGGB is a lovely true teal linear holographic…but wait there’s more! It also has the teeniest holographic microglitter throughout so as if there wasn’t enough get up and go in the holographic nature of the polish she went ahead and added more holo…let me tell you that this polish in the sunlight is so stunning it might be dangerous to drive! Now, I mentioned that it’s amazing in the sun (actually anywhere) but for photos I had a problem because despite the fact that I live in the South it has been cloudy and raining off and on! That means NO SUN *sigh* so I took a photo with flash so you could see that it has a definite strong linear holographic quality. This is what I would call a jelly holo and it starts off sheer but I was able to get away with 2.5 coats (extra at the tips to combat VNL). The formula is very workable, buildable, and even so it works out great! Next up is my favorite and I already think I might need a backup bottle. Hands down the best gray polish I own and it’s inspired by the Edgar Allen Poe poem, Annabelle Lee. 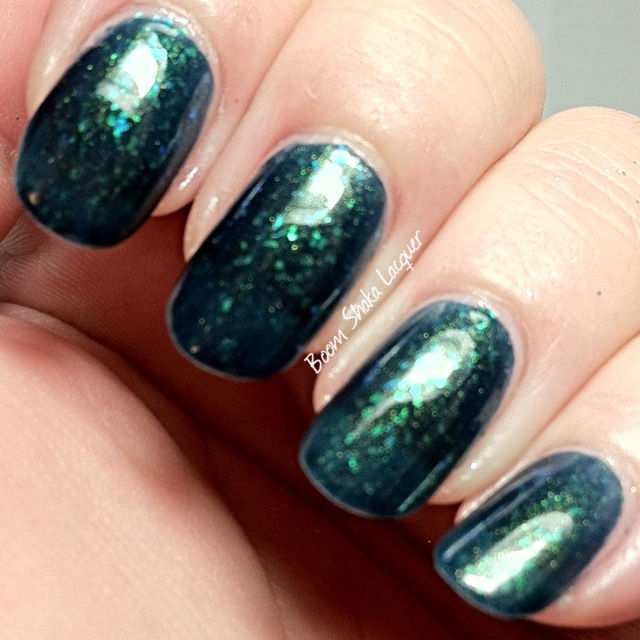 This polish is fittingly named after the poem and Amazing Amy has done a fantastic job of capturing the feel and essence of the poem in this polish! Isn’t it beautiful? I’m so in love with this one. I spend a lot of time looking for awesome gray polishes because the color really suits me plus it’s my go to neutral in nail art. This is a very slightly warm light to medium gray jelly polish that is packed with teensy tiny iridescent microglitter and dark gray microflakies (FLAKIES ya’ll…I LOVE FLAKIES…*coughs* sorry about that I got carried away). Now the formula on this one IS sheer (I can’t wait to play with some stamping nail art with this one) but the color is easily buildable and I did not need undies with it. This photo shows 3.5 coats, as per usual most people and even I would get away with three coats but I add extra to the tips for photos due to prominent nail lines. Also I thought that this one might dry a bit gritty given the sheer quality of the base and all the microglitter but honestly one coat of topcoat was all it needed and I didn’t think it was gritty at all. Polishes Used: Glisten & Glow – Stuck on Blu; Literary Lacquer – Annabelle Lee; Digital Nails – Ain’t Nobody Got Time for That Topcoat. 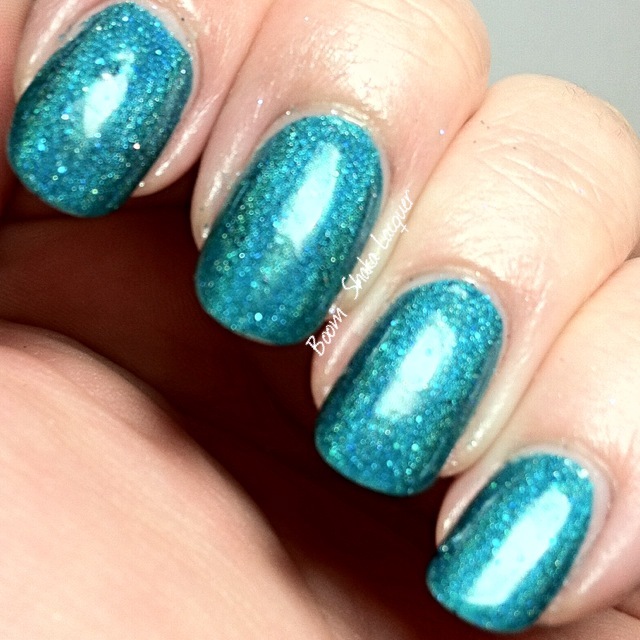 I think, while Literary Lacquers has some amazing and beautiful holos, that her glitter and flakie polishes definitely deserve more time in the limelight because they are just as delightful as the holos! What’s that, you want to know how to get your own reading inspired nail polish? Well wait no longer I will have stalker links below! 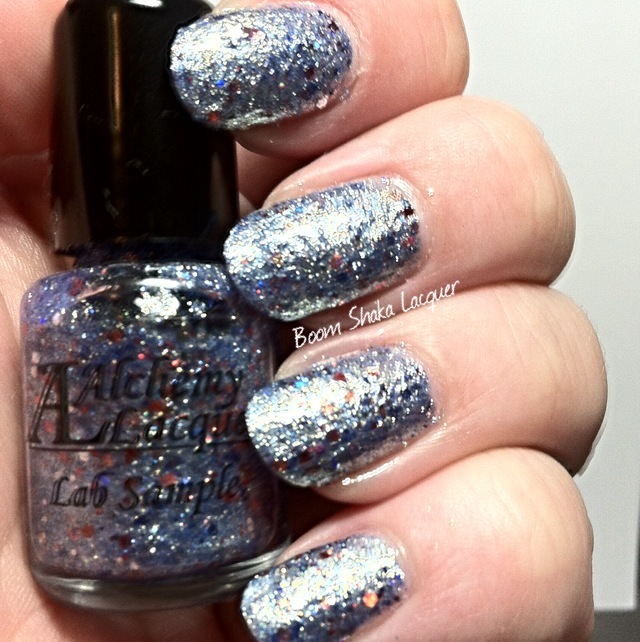 Alchemy Lacquers – Lab Report – July 4th Special! Gilded Patriot is just GORGEOUS! It’s a blue based polish with that characteristic Gold-Silver switch that makes us all love the Gilded polishes from Alchemy Lacquers so MUCH! As if that wasn’t enough there are red, blue, and silver holographic hex glitters just sparkling throughout! It’s like amazing fireworks on your nails…just perfect for all your patriotic July 4th festivities! 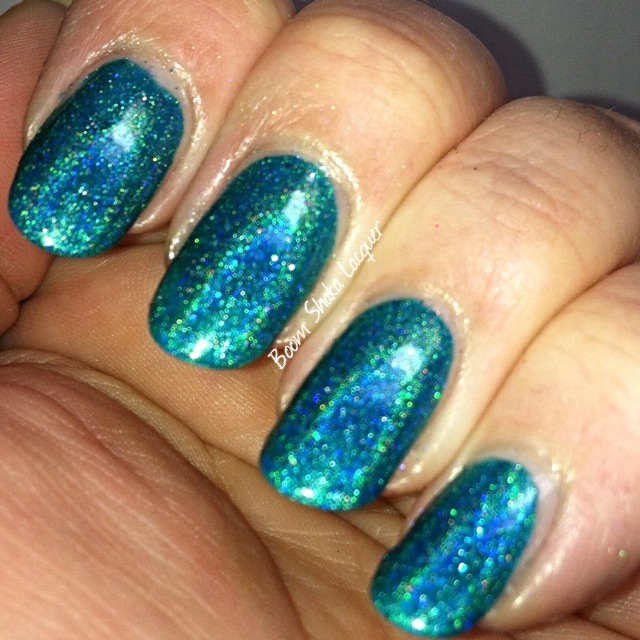 The formula on this was all that I’ve come to expect from Alchemy Lacquers and particularly the Gilded collection. The photos show two easy breezy coats with topcoat. I was sorely tempted to not topcoat this one and let it be a little bit textured and I may do that when I wear it for the 4th of July but I topcoated it for the pictures! Polishes used: Sally Hansen – Complete Care 4-in-1 Treatment; Alchemy Lacquers – Gilded Patriot; Digital Nails – Ain’t Nobody Got Time for That Topcoat. Guess what readers? You’re in luck because this beauty is available TODAY at 8PM EST! You can keep up with all the news and happenings on Alchemy Lacquers’ Website and Facebook page. You can see sneak peaks, swatches, and other fun pictures on their Instagram. Most importantly you can BUY your very own Alchemy Lacquers from their Etsy Shop! 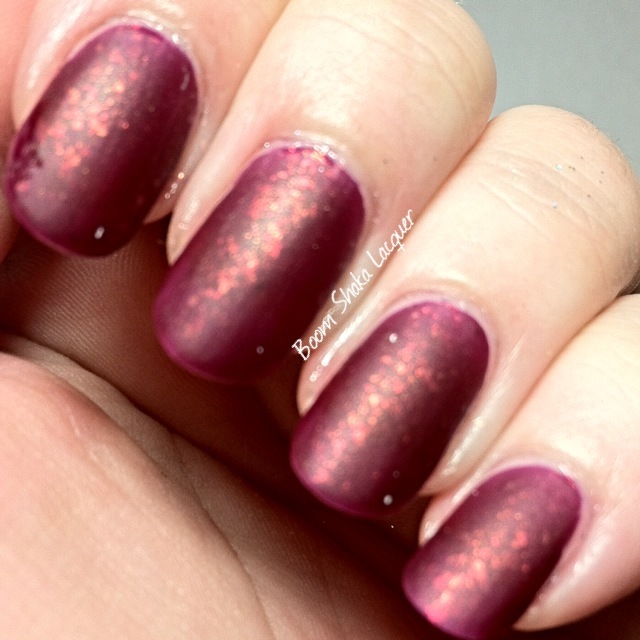 This entry was posted on June 20, 2014, in Alchemy Lacquers, Indie Polish.